Moving images can grab attention and evoke a response more effectively than a still image, but that usually involves shooting video, with all the planning and skill that goes with it. Or you can take a half-way house approach with a cinemagraph, but this still either requires video as a starting point or a series of still images you carefully layer and blend, one frame at a time. Corel PhotoMirage doesn’t need either. It works on single images, not videos or multi-frame sequences, and its drag-and-drop approach is designed to be as simple as possible. 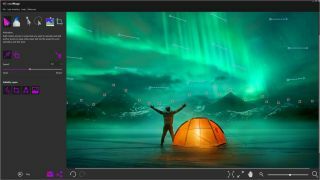 Indeed, Corel is touting its simplicity and basic requirements – any still image will do – as its key selling points for users who don’t have the time or expertise for preparing regular video. It works with JPEG, GIF, PNG, BMP, TIFF or Raw files using a three-step process of isolation, animation and previewing. You define the areas you want to move and the type of movement you want them to have using Motion Arrows, and you protect the areas you want to stay static with Anchor Points. Alternatively, you can use regular masking tools if you find that easier. You can also crop and enhance your images and then preview them before exporting them to social media, sharing sites or other destinations using export presets. The PhotoMirage website offers sample animations created by users, and these can be surprisingly effective. Obviously the movement is limited by the degree to which areas and objects can be manipulated, but these are intended to be animated images rather than movie clips – just look at the incredible online popularity of animated GIFs. Corel is aiming PhotoMirage at business marketers who want to get noticed and convert traffic, as well as pro photographers building a unique online presence and keen photo enthusiasts who just want to try something new and different. PhotoMirage is a desktop app for Windows, and sells for £49.99/$69.99, though you can also download a trial version.